Indian Summer, Dome Opening and New Website! Here at our lovely retreat centre we are enjoying an Indian Summer. It’s the 22nd of October and the temperature is 30 degrees celcius. Eat your hearts out or better still come join us!!!! So much has happened since my last blog post. Most importantly the fabulous Om Dome has happened!!!! So much more than we expected went into the construction and perfecting of this space, but now it is very REAL and yet again I am in absolute awe at my manifesting skills. I practically willed it into existence. What is so magnificent about this Dome is that it is even better than my wildest dreams. I feel awed when I walk into it. It has a real cathedral like feeling to it. My heart sings when I open the door. A small devoted group of people worked their butts off to make this happen, including Harry, our dear retreat manager, and Richard my dear old friend and then a team of staff and volunteers who worked really hard, first on the Indiegogo campaign and then on the actual Dome construction. I am so grateful to have had this awesome help. I bow down to all of you heros and heroines! Our Indiegogo campaign raised 40,000 Euros towards the project and this was a big achievement. This is about a quarter of what it actually cost. Without it we wouldn’t have been able to build it, so I am extremely grateful to everyone who donated. It was such a cool experience to run a campaign and it involved a lot of work for all of us! The last part of the Dome project in early September was the most fun as we had a few different artists flown in from London, to help Thea, my PA, to paint murals on the walls. Watching the murals slowly appear was really exciting!!! What great talented and dedicated artists we had. There is still more to go with the mural painting-we are not finished yet-so stay posted! 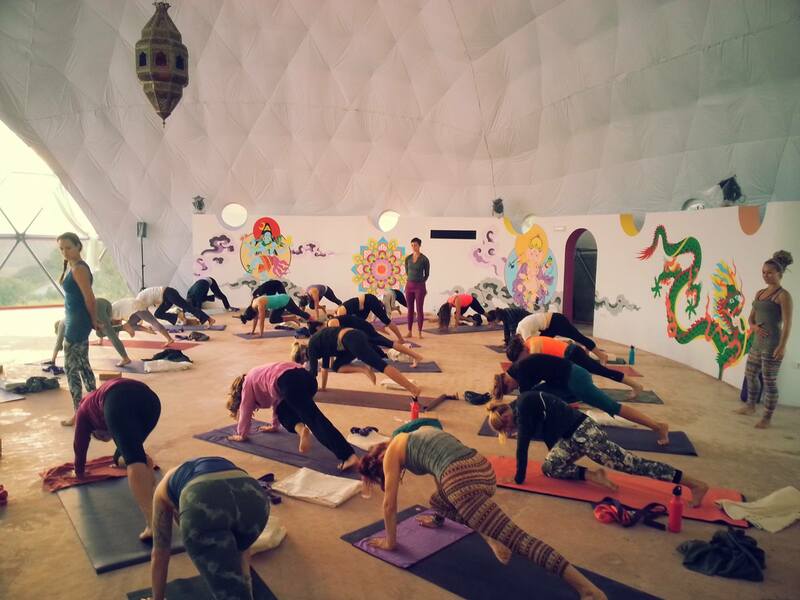 I taught part of my September Yoga Teachers’ Training in the Dome, namely the morning classes. It was so beautiful to see the sunrise every morning from the huge bay window. As soon as it came up we had to draw the curtains so no-one got overheated by the late summer sun. During this time we watched the murals grow, the electricity go live, and little improvements every day. On October 11th we held the Grand Opening of the Om Dome. About sixty local people came, which was awesome, as well as our dear friend the actor, Jerome Flynn, who was filming Game of Thrones in Seville. Most of our Spanish friends were as excited to see Jerome as we were but for different reasons! The opening was perfect, even though it took place during a large thunderstorm and deluge of rain! I taught a Yoga class in the Dome with about sixty participants accompanied by live music form the very talented Saheed, on all kinds of Indian instruments, including his beautiful voice. We also had Jessica Brookes playing singing bowls during savasana. Aaah heavenly!!! It was perfect and everyone loved it! After that we had an amazing healthy-style Spanish dinner cooked by our chef, the amazing Gemma and team. The tables in the dining room looked really swanky as we set them with wine glasses and wine on every table, as well as flowers and candles. The dining room was buzzing! After dinner we had a flamenco concert with our dear friend Tino. Tino is a Dutch guy who has lived many years in Seville and has mastered flamenco guitar. He plays professionally in Seville and is an uber-talented virtuoso. We are very lucky to know him! He loves Suryalila and we love him, so he comes any time we invite him and wows us and our guests with his extraordinary talent. Finally DJ Ali and Saheed played music to dance to and we got down on the dance floor. The music they played was electro Indian and really funky and we loved it! We realized what a great discotheque the Dome makes, with our versatile lighting, awesome sound system and a great vibe. We will definitely have them back!!!! After all the Dome excitement it was back to work big time to get the new website finished. We have been working on a new website for Suryalila for the last three months. Jorin Hawley and Paddy O’Hanlon designed and created the skeleton and then Jessi, Lydia and myself put the meat on the bones. We have been putting in a lot of hours the last few weeks to finish it. We are really excited about it as it is much more professional and looks much better than the old one and is SEO optimized, so hopefully we will start to come up organically in Search engines, very soon. Today is the day we launch our new website. Yeah!!!!! So exciting!!! I love the Dome! I love Suryalila! I love the new website! I love my life! I am profoundly grateful to life and to all of my friends! Hope you come visit us soon. Please tell me how you like the new website http://www.suryalilaretreatcentre.com going live 5pm October 22nd Spanish time. Drink some champagne with us! Cheers! On Tuesday I participated in my first yoga flash mob after two weeks of intense preparation.I choreographed and cheer led the whole enterprise and thought that it went really well for a first try! The timing was perfect as I have a Yoga Teacher Training Program happening at Suryalila. There are 31 Yogis and Yoginis here training with me, so I asked for volunteers to help with the flash mob. We had 24 Yogis and Yoginis participate in all. We decided to do a 5 minute routine. There were three different sequences being performed. To open the flash mob we asked Alex, who is a gymnast in the training to do some somersaults to draw everyone’s attention. We chose a busy spot near the cathedral in downtown Seville. Jennilee and I began the first sun salutation and then quickly two others joined us, then 6 more and finally everyone jumped in. It was a perfect day with beautiful early summer sun. This was an improvement on the 40 degree weather we had had a few days before when we were rehearsing in the parking lot at Suryalila. It was a lot of fun. Afterwards we repeated the whole thing at Plaza de Espana but it was a quiet moment there and not as effective, so we decided to stay with the original take. My dear friend Lisa from the Beeb did a great editing job for us and we are busy trying to get it to go viral! Also, please do pass this on to your friends whilst it’s hot off the press. We are super busy at Suryalila preparing for a fund raising Yoga Festival on July 28 and 29th. We have all day Yoga planned and live music as well as food stalls and massage stalls. We are all looking forward to sharing yoga with a mostly Spanish clientele. We are still thick in fund raising for the Om Dome Project and hoping for a visiting angel to manifest to boost our campaign! Dome preparations are well underway as we meet with the builders for the platform and finalize the design of the Dome itself. I have a little over a week of my training to go and everyone seems happy and making a lot of progress with their teaching.Suryalila is buzzing as we have a few volunteers in the office now helping out with marketing and we are busy sending out emails to Yoga teachers who might want to come here. Suryalila rocks! It’s a new era at Suryalila Retreat Centre in Southern Spain. Yesterday I officially became the CEO or Administrator of Suryalila. Four years ago opening a Yoga Retreat Centre was a big dream that I had. Today it’s a wonderful reality with unlimited potential. My business partner and former CEO, Peter Simmons, has just left Suryalila, and I am extremely grateful for everything he has done to make this dream a reality and to set a good foundation for the business. I am thrilled to be in the pilot seat of my creation now, as I still have so many aspects of this vision that I desire to manifest. We have had a glorious Spring here and I am so loving my home. It is a joy to wake up to the profound natural beauty we are surrounded with, and I am grateful for every single day here. We have such a fabulous team of people living and working here right now. This includes our little Dutch family, Harry(our intrepid Retreat Manager), Mirella (Shakti Boutique keeper extraordinaire) and Leela (our little wild child and mascot) who live next door to me in a very sweet house that feels more like a temple inside. Then there is Thea, my fun, creative and upbeat PA, Jessi, our lovely sweet and talented, Office Manager, and our three fabulous cooks Gemma (an English Belle), Caroline (a sultry, tattooed German) and Javi (our token Spanish raw food hippy sweetie). Richard is also here, supporting Harry and tirelessly cleaning the pool! We also have a few more wonderful Spanish members on staff; Tanea (what would we do without her) in the office and doing book keeping; Encarni, tirelessly keeping Suryalila clean, and Manuel taking care of our gorgeous gardens. At the moment Paul and Sarah are here doing massage. Our massage therapists usually do three-month stints. Paul is a returning Thai Massage practitioner. He has been so busy since he arrived that I haven’t had a chance yet to get a booking with him. Last, but not least, we have a rotating crew of amazing volunteers. So many smiling faces and good vibes, always ready to help out, wash the dishes, sweep the courtyards, teach Yoga, give massages. Altogether, a high energy and lovely crew of happy people, all thrilled to be living in a place of such peace and beauty. The new era is about sustaining and preserving. We have created something extraordinarily beautiful and now we have to sustain it. In the Hindu trimurti Brahma is the creator, Vishnu is the Sustainer and Shiva the Destroyer. So you could say we are in our Vishnu stage! Sustaining doesn’t mean kicking back and resting in this stage of our business, it means rallying the forces, perfecting our systems and hanging in there really well. For me this also means expansion, continuing to grow and get better and more interesting. One of my goals is that each time a teacher comes back with a group she/he is pleasantly surprised at the great changes that have happened since they last saw the space. For example, we finally were able to upgrade the pool area and create a deck, shade and buy some wooden bed-chairs with mattresses and big pool towels. This immediately made the pool area so much more inviting and chic. Pool post makeover – picture yourself here! 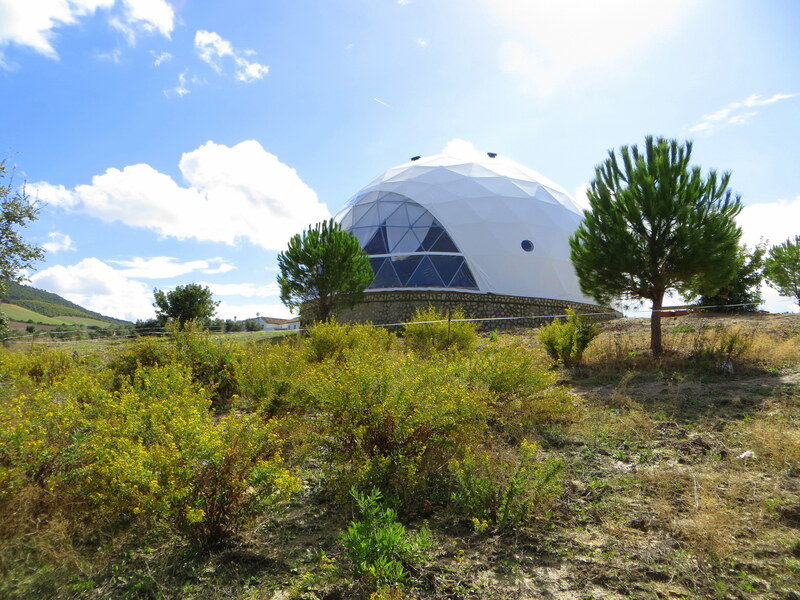 Our next big project is to build a massive Sacred Geodisic Dome, which will become our new Yoga Hall by August. We have great plans for the Dome. It will have an under-floor heating and cooling system as well as solar fans. We will build two large curved walls inside for practicing inversions. 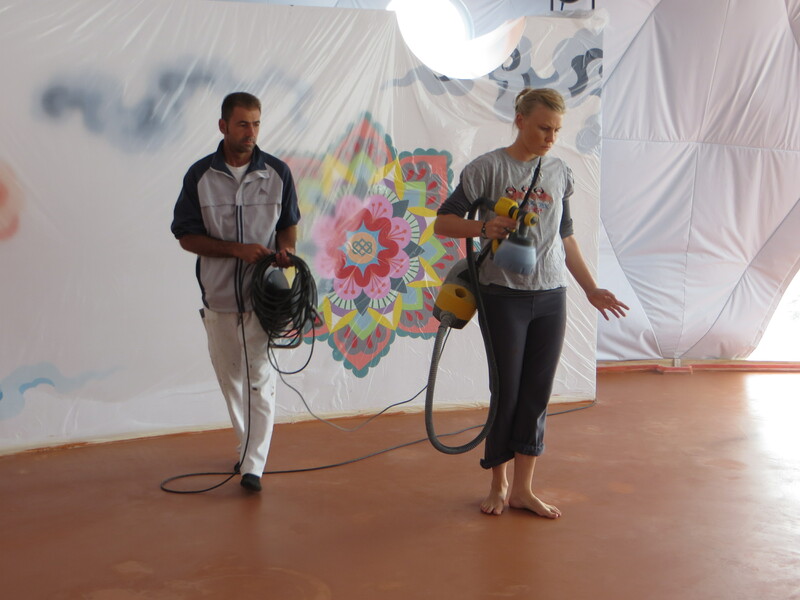 These walls will be painted with beautiful murals of Tibetan Goddesses and poetry and sacred symbols. My assistant Thea will be heading up that art project. 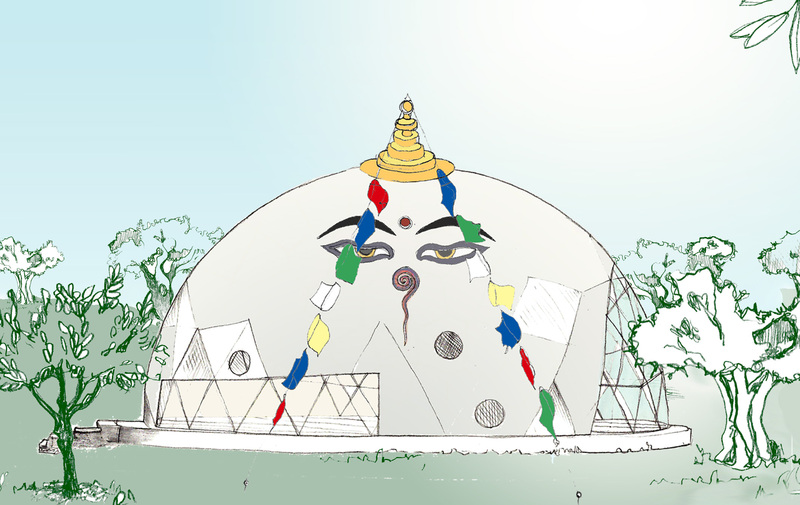 The outside of the Dome will be made to look like a Nepalese temple with a cupola on top and the Buddha eyes painted on the outside as well as beautiful decorative features around the doors and windows and strings of Tibetan prayer flags cascading down from the pinnacle. This beautiful Yoga temple will be nestled in our olive view with gorgeous all round views. We will also expand our accommodation, so we can hold up to fifty people. This project is pretty far along in planning and we are now moving to the second stage of the project, which is fund-raising. We have chosen to launch our first crowd-funding Project with Indiegogo to finance the construction of the Dome. We are a few days into the fund-raising now and it is going well, as well as being really time-consuming and a little nerve-wracking. I put my first deposit on the Dome today! I am really happy that in April I held our first detox retreat with my dear friend Katherine Miller. It went really well and I was very happy to have Martin Clark from Om Yoga Magazine on this retreat. Martin has written a lovely article about Suryalila, which is coming out in the July/August of Om Yoga Mag. So please look out for that. He has also written an article on crowd-funding, and has mentioned our OM Dome Project. That will be in the same issue. I am going to start writing philosophy articles for Om Magazine and lastly I am going to be featured in the September issue. I am so grateful to Martin for this exposure. In a few days my summer training at Suryalila is starting and we have a full house. I plan to do the flash-mob in the middle of my training, with my trainees, so stay posted for that. After that I am heading to the USA to Omega Institute to teach an Envision Yoga Weekend Workshop with my dearest friend and colleague, Jennilee Toner. Then straight on to Bali for another massive training! Its all systems go in my life! I just have to remember to breathe and to pinch myself when necessary-which is most of the time!! !